Strawberries are a much-loved fruit in our house, but they’re only adored when they are sweet as can be. If I can find strawberries that are tender and ripe, and aren’t in need of any sugar or cream or anything except for their sweet selves, I’m willing to fork out the big bucks for those guys. There really is nothing worse than tough, flavorless strawberries. Look for the good ones at farmer’s markets (those should be opening soon in most places) and better markets. 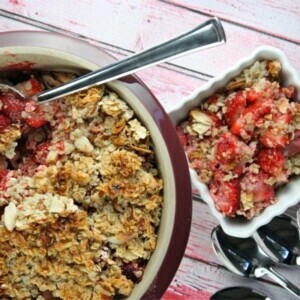 This fresh strawberry crisp has a buttery oat and almond topping, which is great for everyone (even my gluten-free friends- since it’s easy to use gluten-free oats). When those sweet strawberries are baked in the oven, they become even more tender and sweet… and the juices emerge too, making it wonderful to eat with the crumbly topping. 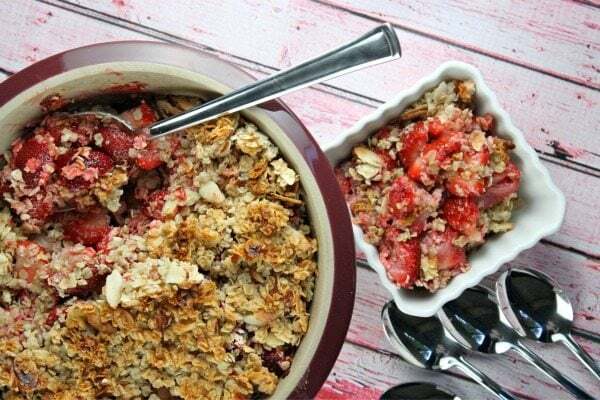 You can totally add ice cream or whipped cream to this juicy strawberry crisp, but it most certainly doesn’t require anything to accompany it. We enjoyed it just like this. I love that I can share a recipe for Mother’s Day weekend that my own mother would enjoy (she happens to be gluten-free). You can make this crisp with regular oats or gluten-free oats. It’s delicious all the same. 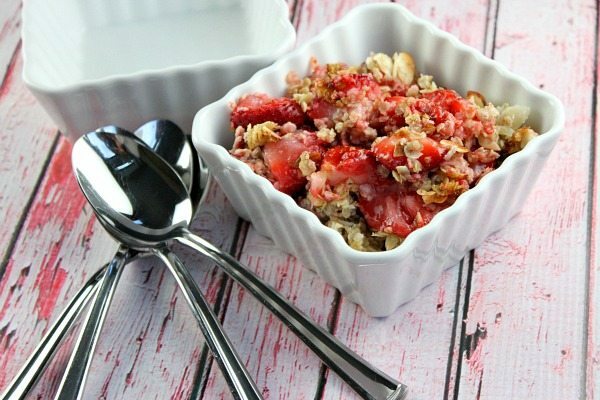 This strawberry crisp is delicious to eat on its own or topped with whipped cream or ice cream. It is best served the day it is made. 1. Preheat oven to 375 degrees F. Butter an 8x8 inch square baking dish (or round) - don't use metal. Use a pie plate in a pinch. 2. 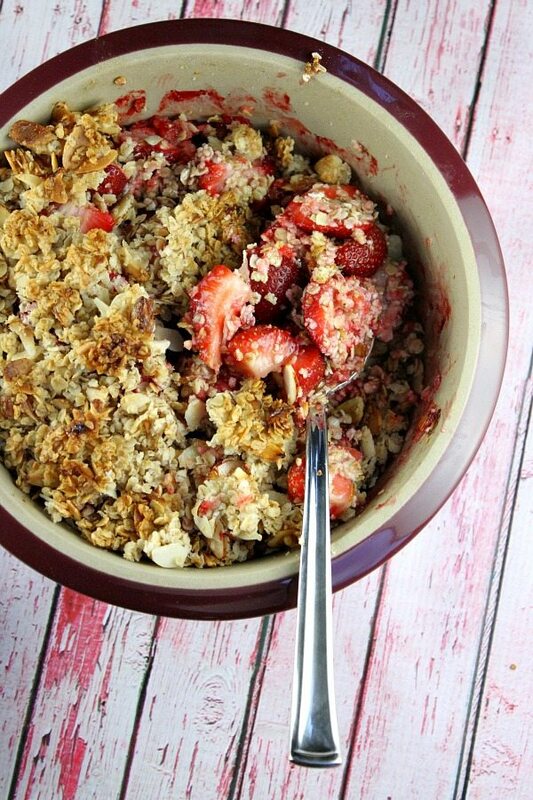 In a large bowl, toss the strawberries with the rest of the base ingredients. Scrape the strawberries and juices into the prepared pan. 3. In a separate bowl, toss the topping ingredients together. Sprinkle the topping ingredients evenly over the strawberries. 4. Bake about 40 minutes, or until the strawberries are bubbling. Let cool for about 10 minutes before serving. 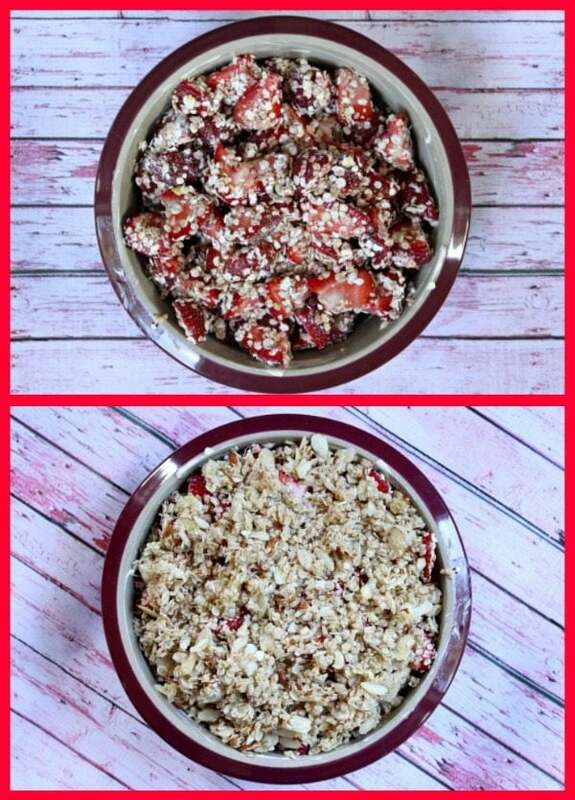 *If you are preparing this recipe as gluten-free, just be sure to use gluten-free oats.